The twice-delayed HA-420 HondaJet: It's a little tougher than rolling out a new Civic. Breaking into the airplane business is proving to be a little tougher than Honda expected. While renowned for its smooth new-vehicle launches and trouble-free supplier relations in the auto business, the company's aviation venture is a different story. 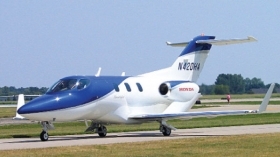 Honda has delayed delivery of its first commercial airplane, the HA-420 HondaJet, for nearly another year as it works out component problems, according to a report in Aviation International News. Honda has told customers that the planes won't be available until the third quarter of 2012, the report says. This is the second delay. Honda was to have begun producing the $3.9 million jets in 2010 but pushed that back to the fourth quarter of 2011. The trade publication quotes HondaJet spokesman Stephen Keeney saying, "Regrettably, we've experienced delays in some components." He gave no details. The jets are to be manufactured at a new plant in Greensboro, N.C., where Honda is investing about $100 million. Honda is unaccustomed to such setbacks in the car business. A J.D. Power and Associates index of vehicle launches ranked the Honda Pilot and Honda Fit as two of the industry's top 10 most successful new-vehicle launches last year.